For the past 6 weeks, fires have been burning all around us, but have not had much impact on us. Things changed yesterday, after 20-25 mph winds started in the afternoon. 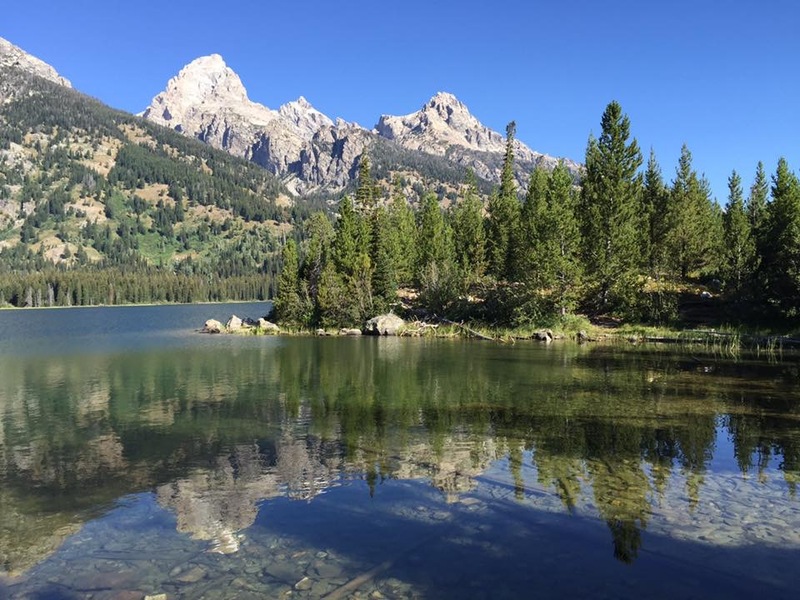 A small fire that was burning in a remote area of Grand Teton National Park jumped across Jackson Lake and spread over 5 miles. The main highway from GTNP to Yellowstone National Park is now closed. They had an emergency evacuation of Flagg Ranch and Lizard Creek Campground this morning. The fire is about 20 miles from our location, and it is not headed our way. However, with another afternoon of high winds expected, who knows what will happen. I think the most popular website in the state of Wyoming right now is Incident Information. You can click on that if you want to keep up with the fires in the area. Work continues, but at a little slower pace this week. This is a “transition time”, as we switch over from families with school-age children, to couples and families with toddlers. By September 1st, we are back to full occupancy, for almost the entire month. So we are enjoying our ‘calm before the storm’ which hopefully won’t involve any fire related issues! Our door is always open for visits from friends and family, and we have had two visits this month. Our nieces, Carmen and Jasmine, were passing through on the way to Tacoma, Washington, and stayed overnight. Jasmine, who graduated from Pharmacy School in May, has accepted a pharmacy position in Tacoma, Washington, and they were moving her stuff out west. Makena was excited to have visitors! After they left, Dan’s sister and brother-in-law, Linda and Doug drove out from Wisconsin to visit with us for a few days. On their way out, they stopped in Custer, SD and met up with our friends Phil and Rudee at Crazy Horse, as well as visiting Mount Rushmore. We were able to switch days with another couple at work, so we had three full days to play tourist. We forgot how exhausting it is to be a tourist! We were able to cram as much as we could in a very limited time. There is just too much to see and do in three days. Can you see Yellowstone in one day? No, but you can see a few of the highlights if you pack a lunch and plan on a long day visiting. We discovered an Elk happily licking the salty grass right inside the West Thumb geyser basin. It is always fun to see wildlife up close. We have heard there has been an unusually high number of broken toilet seats in the park this year, due to visitors from countries not familiar with our bathroom protocol. So I was a bit amused to find this diagram in a porta-pottie in the park. After our stop at the West Thumb Geyser Basin, we headed towards the Grand Canyon of Yellowstone, to see the Upper and Lower Falls. The Lower Falls were just as spectacular! After a quick picnic lunch, we headed over to the Midway Geyser Basin, home to the most beautiful geyser in the world, (in my opinion), the Grand Prismatic Geyser. And no visit would be complete without a stop at Old Faithful! We spent another day touring the Grand Tetons, seeing wildlife, and then we drove down to Jackson. We walked around the town square and stopped in at the Famous Cowboy Bar for a cold beverage. Since all the barstools are saddles, Doug opted to recreate the cowboy on the bar’s roof! Doug and Linda discovered when you are out West, anything goes for a vehicle. You never know what will be parked outside on the street. Although the time went by way to fast, we did enjoy having Carmen and Jasmine, as well as Doug and Linda stop in for a visit. Our door, wherever it may be parked, is always open! Located within the boundaries of Grand Teton National Park are two chapels, both of which are open daily to the public. Both offer services on Sunday for park visitors and area residents, during the summer. And weddings are held at both chapels, with a special permit through the national park service. Built in 1925, this is an Episcopal Church, affiliated with St. John’s Episcopal Church in Jackson, WY. It was built to provide local ranchers and residents a place of worship without having to make the 12 mile ride into Jackson, which was a treacherous trip at that time, before automobiles and roads were commonplace. The cozy chapel seats 65 people, and does offer additional outdoor seating, weather permitting. They do have a Christmas service, but you need your cross country skis, or snowshoes, to make it to the chapel. The roads to the chapel are closed in the winter. The window behind the altar offers a spectacular view of the Tetons. I think it might be hard to focus on the sermon, when you are staring out at this view! Built in 1937, the Chapel of the Sacred Heart is a Catholic Church, affiliated with Our Lady of the Mountains in Jackson, WY. It is right on the shore of Jackson Lake. Unlike the other Chapel, it does not take advantage of the views of the lake, as there are no windows overlooking the lake. My guess is the Priests want you to pay attention during Mass! No view out this altar! The chapel holds 115 people for mass. The stations of the cross are very simple plaques. Well I can’t have a post about the chapels, without putting in some wedding photos! The step-sister of our boss was getting married on Sunday, and they had the wedding on the grounds of our cabins. I was working in the office that day, and fortunately all of my check-in’s for the day had arrived. Many of our guests noticed several people all dressed up, and I mentioned there would be a wedding in the early evening. They all commented on what a beautiful setting it would be for a wedding. Since all my office work was technically done, I decided to be a ‘wedding crasher’, and attended the small family wedding. It was a nice ceremony, and Brad gave away his step-sister. Despite the clouds from a recent rainstorm, it was a beautiful backdrop for a wedding. One final note, when I was out watering the planter boxes by the cabins, I noticed this small bird, or a large moth, pollinating the plants. I have never seen this type of bird/moth before, so if anyone knows what it is, let me know!